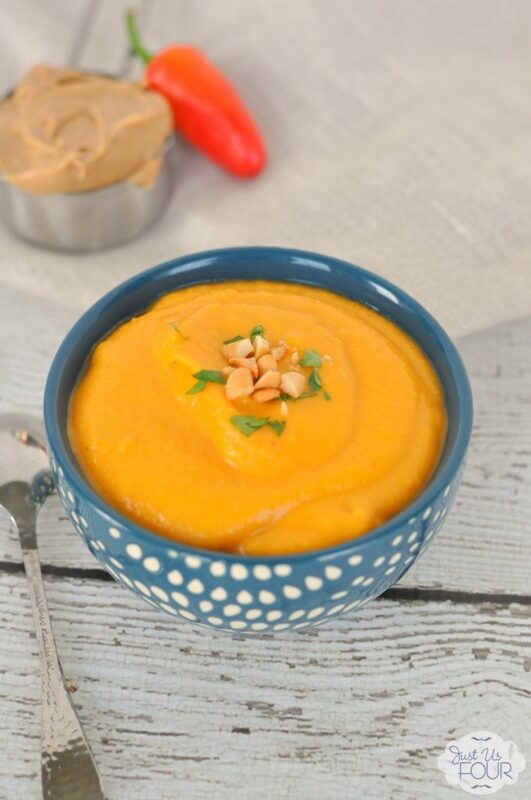 Grab some peanut butter and use it to create this delicious Thai Sweet Potato Soup that will have everyone bringing their bowl back for seconds! Every year, I serve a similar menu for Christmas. Mathlete doesn’t love turkey so, after Thanksgiving, we don’t have that again until next Thanksgiving. I started making a beef tenderloin a few years ago and it is always a hit. For the days leading up to Christmas though, I like to have things that are sort of non-traditional so no one gets tired of sweet potato casserole, mashed potatoes or any of the other classic holiday dishes before Christmas ever even arrives. I was reading an article the other day called Peanut Butter Reimagined and loved the idea of using peanut butter in savory dishes. It has been cold and rainy here so Thai Sweet Potato Soup sounded like the best way to warm up. We are huge peanut butter lovers in our house so anything we can add peanut butter to is a complete win! So many times, we make desserts and other treats with peanut butter (I’m looking at you peanut butter buckeye dip) but don’t always think to use it in savory dishes. 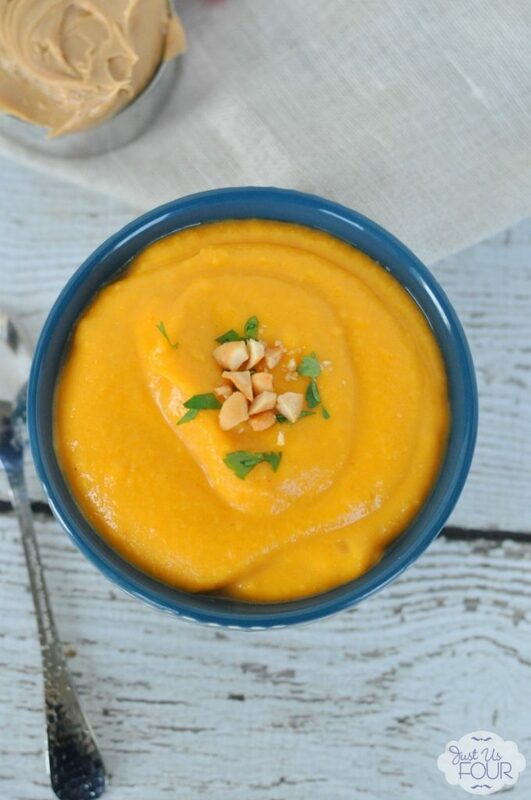 Adding it to this sweet potato soup recipe totally changed all of that though. It was the perfect addition to compliment the spicy Thai chili sauce. What are your favorite soups? 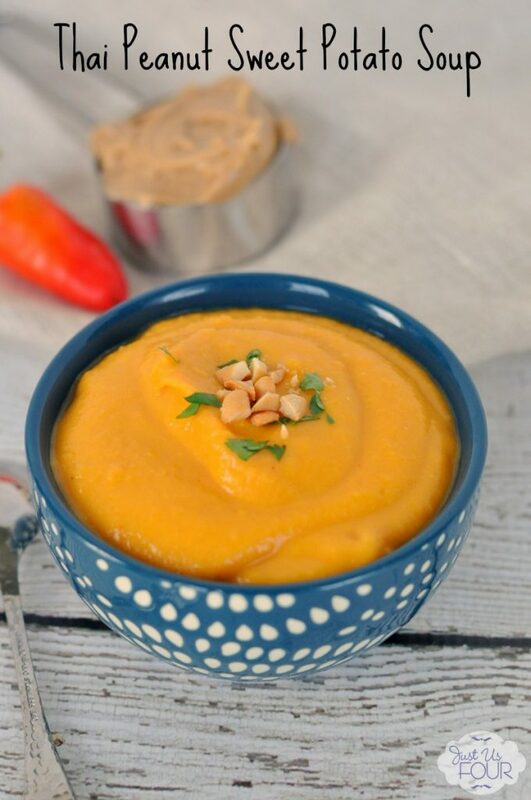 Do you use peanut butter in savory dishes? Heat oil in a large pot over medium heat. Add onion and garlic and saute for 2-3 minutes. Season with salt and pepper. Add sweet potatoes, vegetable broth and water. Bring to a boil and then reduce the heat to low. Simmer, covered for 20 minutes or until sweet potatoes are tender. Add peanut butter and chili garlic sauce to the pan and continue pureeing with the immersion blender. Top with chopped peanuts and chopped cilantro before servings.